Well here we are again and another week bites the dust! It was a beautiful day here and I have spent most of it putting everything, well perhaps not everything, back in our newly refurbished bathroom. We are delighted with the finished result and there wasn't too much mess. 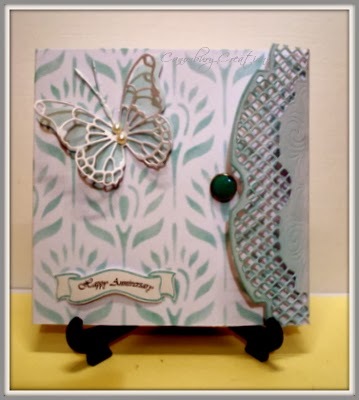 The next card I want to show you is the anniversary card I made for my sister Karen which was last month but I forgot to post it, on my blog that is! So glad you managed to save your bee card...it's beautiful. I must get myself one of those pricking templates. your LIM card is just amazing, val... so glad you were able to save it after your little accident! the anniversary card is just lovely! Both are beautiful Valerie! I also love to work with templates. Not to much work and a great result, what do we need more? I love your bee card Val...it's a great design! Wonderful cards! Love the one-layer bee card. Two fantastic cards, love the one with the bees. Two gorgeous cards Val. 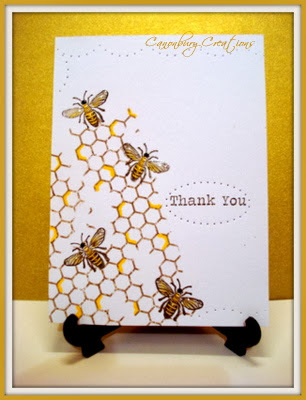 Love the bees and the honeycomb background, and the ornate border on Karen's card is fabulous. Love your bee card! Great design and the piercing is perfect. Two lovely cards - so glad you could rescue the bee one from the inky accident. Hi Val. Great save on your beautiful bee card! :) We have all been there, done that! Well saved Val! Heart stopping moments.........so glad it happened in the corner and you could cut it down. Love the bees and the honeycomb background. Our anniversary card is gorgeous IRL - thank you.